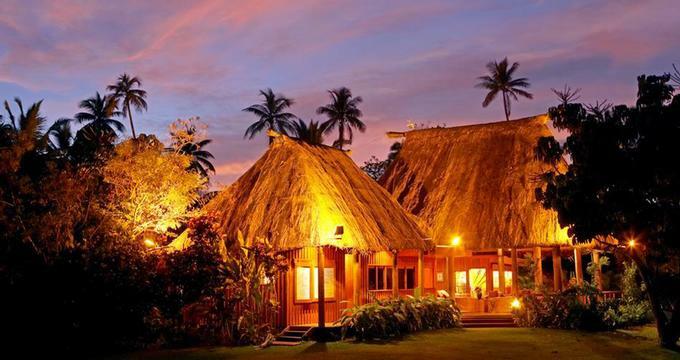 Namale is a luxury honeymoon hideaway in Fiji, offering guests the ultimate in privacy and seclusion. The resort has only 16 guest bures located on 325 acres of white sandy beaches and tropical rainforest. The resort spa is a place of healing and rejuvenation with a choice of treatments inspired by ancient traditions. Vacationers get unlimited use of the hydrotherapy/aromatherapy room with floor-to-ceiling windows overlooking the ocean. The room has a spacious jacuzzi, a waterfall pool, four soaking tubs and a steam room. Treat yourselves for relaxing couples massages on your island honeymoon. The resort offers a long list of complimentary vacation activities, including snorkeling, water-skiing, kayaking, water trampoline and hand line fishing. Volleyball, tennis, badminton, table tennis, basketball, virtual golf and croquet facilities are also available free of charge. There is plenty to do on this tropical island honeymoon. Daily scheduled activities provide a good way to explore the island. Choices include Fijian village tours, coconut shows, mountain biking, guided reef walks, snorkel boat excursions, horseback riding, waterfall tours and rainforest hikes. The resort has 16 luxury guest bures and villas. Honeymoon Bures have a private deck with a panoramic view of the beach and a two-person spa tub and shower. Deluxe Honeymoon Bures have a private plunge pool on the outdoor deck. Namale has two luxury villas - Bula House and Tatadra House. Guests staying in a villa have access to a personal chef for dinner. Resort chefs use fresh local ingredients to prepare meals with international influences. Most of the vegetables are grown in the organic greenhouse. A healthy spa menu and a vegetarian selection of items are available to resort guests. The hotel band performs six nights a week and the local villagers perform a Traditional Fijian Meke (Dance Ceremony) once a week. Fly to Nadi International Airport and from there transfer to Savusavu, a one-hour flight. Resort staff will meet you at the airport in Savusavu on the island of Vanua Levu. Bure rates start at $1,170 per night for two. The rate includes all meals, beverages, daily laundry service, and island activities.